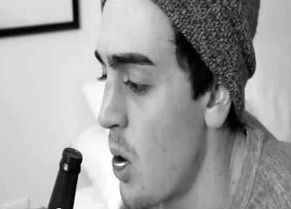 Lindsay's brother, who is credited as Michael C. Lohan, stars in the five-minute black-and-white short set to a song. The film features no dialogue but shows Lohan repeatedly spitting beer bottle caps from his mouth and moping around in a balloon-filled room. Actress Elba Camera briefly co-stars as an apparent lost love interest. Proud big sis Lindsay promoted Michael and the film via Twitter yesterday. "My lil brother Mike in this new short film!" she wrote, adding a link to the video. Though her own career has taken a hit, Lindsay is excited for Michael's foray into acting, according to mom Dina Lohan.